Tips to keep you and your precious baby safe and comfortable no matter what your mode of travel. When you're pregnant it's always wise to take extra precautions when travelling. I went on a 6 hour road trip when I was in my first trimester and the first thing I did with my unpredictable morning sickness was load up on ginger beer (the only thing that helped ease the queasiness). But here are some more tips to ease your journey wherever you may go. It is safe to travel by plane in your first and second trimester, provided there are no complications with your pregnancy. The second trimester is probably a better time to travel because you will not be plagued by morning sickness and will not suffer from the usual discomfort experienced in the last trimester. Travel on small planes is less safe as they do not have pressurised cabins. Most airlines don’t allow women to travel late in their pregnancy because of the possibility of premature labour. Every airline has its own regulations. Check when you make your booking to avoid being turned away when you're checking in. 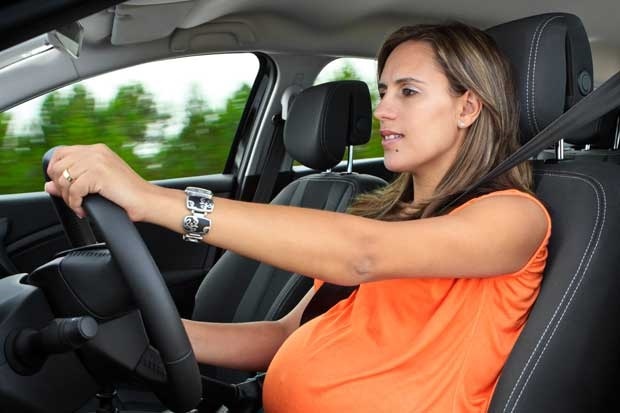 Long car trips are safe throughout pregnancy. If you're struggling with morning sickness, pack water, ginger biscuits and a barf bag so you're ready for anything. You can safely wear a seatbelt throughout your pregnancy. The amniotic fluid and your body provide a cushion for your baby. Airbags are also safe but move your seat further away from the dashboard. Sitting for long periods of time can make your ankles and feet swell and can cause leg cramps. If you travel by car, take frequent breaks you will probably need it to go to the toilet! In a plane, stroll up and down the aisle. Do stretching exercises: flex your foot to stretch your calf muscles, rotate your ankles and wiggle your toes. There is an increased risk of thrombosis (deep vein blood clots) when you are travelling. Support stockings will help to improve circulation and will relieve swollen veins. Avoid travelling to areas where malaria is a risk. Be careful what you eat and drink when on unfamiliar territory parasites can be more dangerous for pregnant women. As a new mom Carrie Linder finds out that her travel first aid kit needs a serious upgrade. Some strategies to help your kids cope while you're away. Children power drives family getaways. Know which emergency items to pack. Don't think your days of travel are over just because you have a new addition to the family! Come 1 October 2014 you'll need an unabridged birth certificate to travel with your child. Do have any tips for pregnant moms who have to travel? Tell us by emailing chatback@parent24.com and we may publish your comments.